Lauren Arnold is pictured with her game ball commemorating her 500th career dig with the Lady Lions volleyball team. Lauren Arnold, a senior volleyball player at Fairfield High School, recorded her 500th career dig on Tuesday, September 25, at home versus the Lady Greyhounds of Manchester. Arnold is a four year member of the volleyball program with the Lady Lions and has been relied on to provide leadership for Fairfield in 2018. The game was stopped on Tuesday and Arnold was honored for her accomplishment and given a game ball. Arnold is the daughter of Tony and Cathy Arnold who were on hand Tuesday to witness the milestone. Arnold has been a major contributor to the Lady Lions volleyball team this season and has helped them to an undefeated record in Southern Hills Athletic Conference play. Lauren is also a member of the Fairfield Lady Lions softball team and has been a part of three consecutive District championships with the team. The Lady Lions won the matchup on Tuesday against the Lady Greyhounds at Grandle Gymnasium. Fairfield also welcomed Highland County rivals Whiteoak and Lynchburg-Clay on Thursday, September 27 and Friday, September 28 respectively. Thursday’s game was designated as a “Volley for the Cure” game with all proceeds being donated to Shannon Miller who is currently battling breast cancer. The Lady Lions won both matches to solidify their grip at the top of the SHAC volleyball rankings. Fairfield will be back in action on Tuesday when they welcome the Peebles Lady Indians to Grandle Gymnasium for SHAC volleyball action. 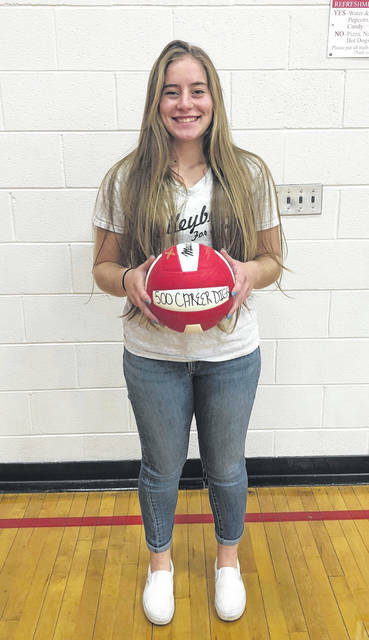 https://www.timesgazette.com/wp-content/uploads/sites/33/2018/10/web1_Lauren-Arnold-500-Digs.jpgLauren Arnold is pictured with her game ball commemorating her 500th career dig with the Lady Lions volleyball team.